Spring has finally sprung! Thankfully! Are you getting ready to make your trek to the cottage? There are some who have already made their first trip out to the Bay. And some would have us know they went swimming in March (as documented by our Bob Mosley seen here to our left)! Brrrrr!!!!! Details on the Introduced Pine Sawfly infestation we encountered last fall are found in the 2016 Yearbook. Please read carefully (pp. 81-89). Although it is still too soon to tell, we are hoping that the cold snaps last fall and those late this spring might be sufficient to kill the sawflies in their cocoons, or the eggs while still unhatched in the pine needles. For those able to visit their cottages In May, the following will provide an update on available pest control and what to look for when you visit your property this spring. I have received several comments about the GBBR flyer inserted in our tax bill, saying that they didn’t remember their Introduced Pine Sawfly larvae (IPS), being so brightly coloured – “that theirs were more grey-green with black heads and about an inch long.” In fact, this accurately describes both the immature IPS and its sister, the European Pine Sawfly or EPS (see photos below). Unlike the EPS, which retains its grey green colour, the IPS develops yellow and white spots as it matures. Both the IPS and EPS are considered invasive pests, both arrived in Ontario in the 1930s; both have somewhat similar life cycles; both require similar methods of control, and both can cause equally devastating damage to our white pines during periods of drought. The only differences seem to be that the EPS appears to prefer Scots, jack and red pine over white pine; that they tend to have only one generation a year; and that they seem to prefer younger pines. More important is the fact that control methods apply to both the IPS and EPS. Unfortunately, current regulations in Ontario prevent property owners from applying either Malathion or Sevin, the only two chemical insecticides that are proven effective against either the European or Introduced Pine Sawflies. While it is possible to gain an exemption to the regulation ban, it requires the services of a licensed arborist to verify the infestation and need for a pesticide spray. He/she will then fill out the forms to apply for an exemption and is responsible for administering the spray. This approval would be for ground spraying only since aerial sprays are not feasible in an island community such as ours. Safer Brand products also offer an insecticidal soap with Neem Oi for pine sawflies, which is comprised of natural ingredients, less harmful to the environment, and reportedly effective in controlling but not eliminating the sawflies. Unfortunately, this product seems to be available only in the United States and I was unable to learn whether it was approved for use in Canada or whether it also required special approval. Note: the approved BTK spray is not effective on pine sawfly larvae. On a more positive note, it appears that some Pointe au Baril maintenance providers have sought assistance from local arborists to administer a control spray. 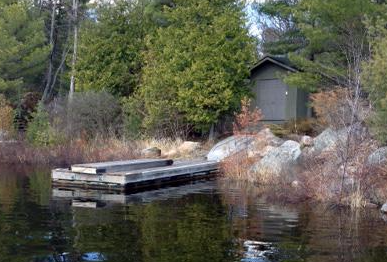 If you were badly infested last year, please check with your cottage maintenance service and ask whether they are offering a spray program this summer. Although not feasible for treating a large number of pines, the application of TreeAzin into the trunks of mature pines has proven effective, and a number of our members have already contacted the licensed applicator in our area — Georgian Tree Services at 705-241-5711. In contrast to previous information, this product needs to be applied only once a year, but repeated the following year. Cost depends on the size of the tree: about $3/cm based on the diameter measured at breast height. This application is best done in June before the larvae begin feeding, you may need to call upon your cottage maintenance services for assistance. They can probably let you know if you have healthy new growth on the trees you wish treated and if so should be asked if they would wrap bands of red plastic on their trunks. It will be your responsibility to call and register with Mike at Georgian Tree Services, (giving your name, Island number and how many trees you wish protected. PaBIA is arranging to have volunteers pick up their applicators at a marina or main dock so we can combine visits and hopefully reduce costs. By mid-May, you should be able to determine the health of individual pines by the amount and health of new growth. This is especially important when selecting trees you wish to treat with TreeAzin. If planning to use TreeAzin applications, mark the tree(s) with red plastic tape, and contact Mike at Georgian Tree Services. Also look for signs of tiny egg sacs inserted along the needles of a pine branch. (see below). These branches should be removed and burned before eggs hatch. 4. Also remove and burn any unhatched cocoons you might find, either on the ground or attached to a tree branch. 5. 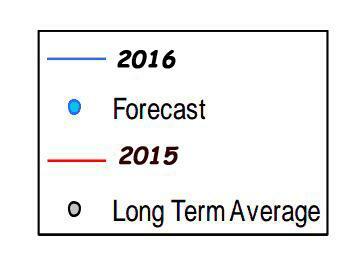 Begin watching for newly hatched larvae in June, which will be time dependent upon the weather experienced in May. They may be first found in masses on lower branches, after emerging from their egg sacs. If within reach, remove the branch and destroy all the larvae. For those on higher branches, hose them down on a tarpaulin underneath the tree, and make sure you kill them all. Remember one female sawfly can lay about 20 eggs. 6. Use of Fertilizer — Although the GBBR recommends the use of fertilizer for stressed pines located on limited topsoil, we urge caution because of its tendency to encourage the growth of Blue-Green Algae as occurred in Sturgeon Bay and the Main Channel. To place fertilizer on top of shallow top soil almost guarantees runoff into the water. If unable to dig in and cover the fertilizer, we might recommend “Evergreen Tree Spikes 11-3-4,” that has a very low phosphate content. One such product is made by Jobe’s in the United States. For further information and where they can be purchased see http://www,aapfco.org/metals.htm. Since these spikes are hammered into the ground, below the surface and along the drip line of the tree branches, they should have minimal effect on any algae growth. And as to the question of whether we have the Introduced Pine Sawfly or European Pine Sawfly?? I suspect we had both. Meanwhile – good luck – keep me posted, and I will try to answer your questions. But the best person to answer your questions will be Dr. Taylor Scarr, who will be speaking to us at the Ojibway Club on Sunday morning, July 10th. His power point presentation on “What’s Bugging our Forests” at the workshop in Toronto last month was exceptional!! First of all, I hope you are reading this because you ARE already on the list as a member of PaBIA’s Junior Member! Or you know a young person who is not yet on the list of Junior Members found on page 279 of your own NEW Yearbook 2016, please forward this newsletter to them! Let’s get EVERYONE involved. OR, if you are the parent of a 20-35 year old young adult who is not yet a member, please forward this to them so that they too can get involved! Remember, as a Junior Member for only $40, each would join a growing list of fun, like-minded folks who love to get together over the summer months on the waters of Pointe au Baril! We don’t want anyone to miss out on the fun. It’s easy to join: just go to PaBIA’s website Membership page to sign-up and pay with PayPal. For those who have ideas and would love to be involved in the planning of various activities, we are always looking for interested folks to help develop some fun junior events! Let’s work together to create some fun new happenings. Please contact Kelly Watson if you are interested! Upcoming PaBIA Events You Won’t Want to Miss…. 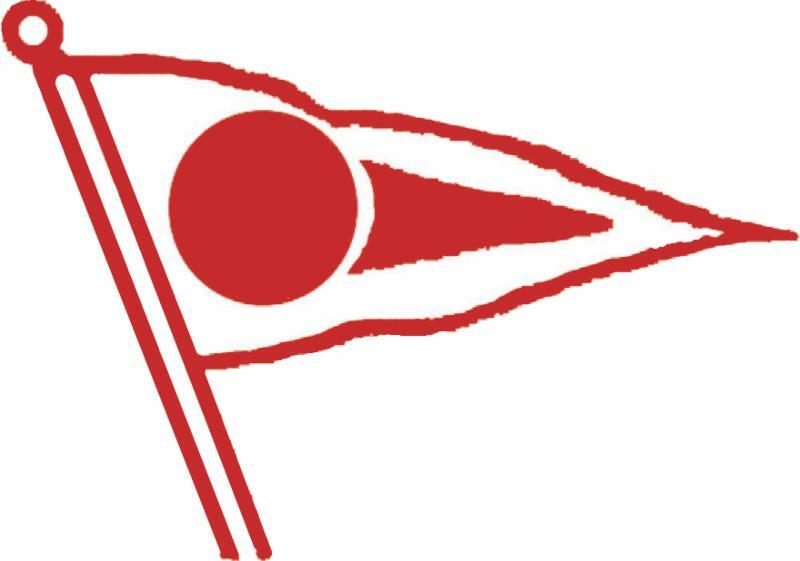 We encourage each member to check out the calendar on the PaBIA website under Activities for the latest events upcoming this summer in Pointe au Baril! And while you are at it, check out the newest editions to the website. David and Alexander have been busy over the winter! And remember, there is a bulletin board at the bottom right hand corner of the home page for you to add any needs/offerings you may have for the summer: babysitting, cottage rental, job opportunities, lost and found, etc. Remember, this is only for our members. The GBA held it’s Annual General Meeting in April, in part to kick off their 100th Anniversary! Congratulations are in order for the GBA, an organization to which PaBIA belongs, representing each member of our organization. For anyone interested, the GBA has made their AGM minutes as well as copies of presentations referenced in those minutes available. Please be aware of the launching of GBA’s new eUPDATE monthly newsletter. This is an important addition to GBA’s communications arsenal. Please note that subscription to eUPDATE is open to anyone wishing to subscribe to it. The GBA is addressing a number of current issues of importance – permits for docks and boathouses, MPAC changes for 2016, aquaculture, and more which are covered in the April eUPDATE and will be addressed in greater detail in the Summer issue of UPDATE coming out May 16th. It’s a great way to learn more about our cottage country’s concerns and what is being done about them! Your PaBIA dues at work! Bruce Tiffin, PaBIA’s Patrolman, will be completing the Spring Patrol Round by the May holiday weekend. Your 2016 Cottage Patrol tags have been mailed to you, tucked inside the front cover of the Yearbooks. Please remember to take the tags to the cottage and attach them at the end of the summer to the front of the buildings to be patrolled in the off-season. Extra tags may be purchased for $30 each by contacting Nancy Rogers. Bruce Tiffin, doing PaBIA’s Spring Cottage Patrol rounds, came across this dock unsecured and having drifted up onto the rocks at the south end of Chicken Channel. Bruce towed the dock onto the shores of A96-40. There is no ID. Please contact Nancy for more details! 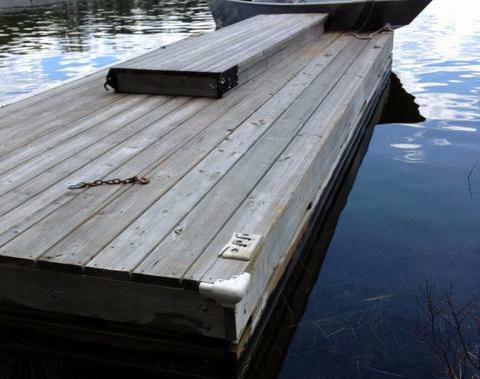 IDEA: Since some docks are stored in the winter up on the island or moored just off the shoreline, might the idea of scratching the island number onto the side of the dock, in case your docks go for a cruise down the bay on their own, be a good idea? 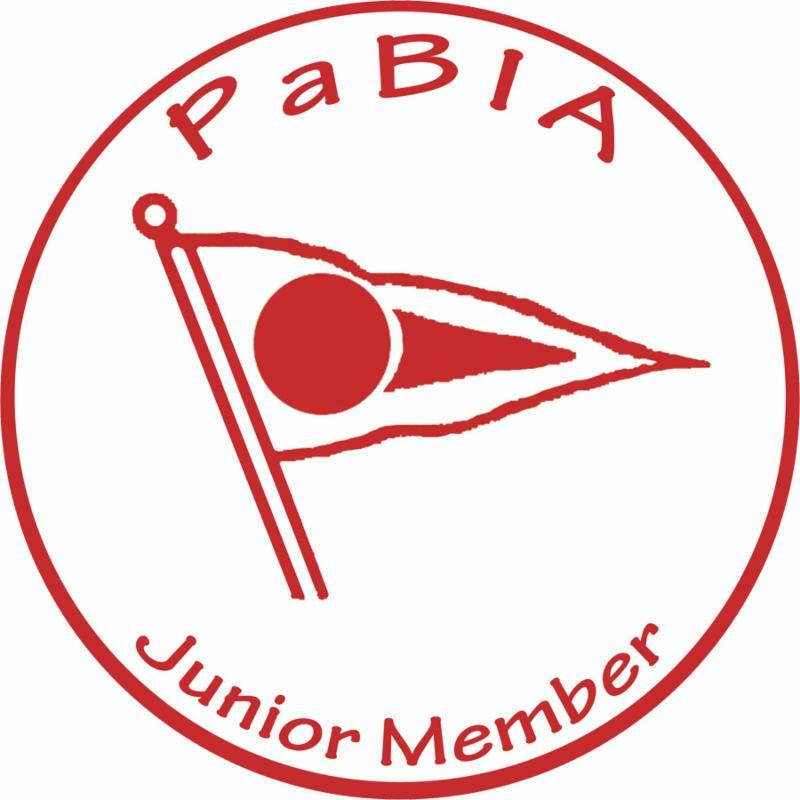 PaBIA is pleased to announce that Nate Stapulionis is re-joining the 2016 Marine Patrol program and Emma Berton will join him as our newest patroller this summer! The new 4 week position of ‘Patroller in Training’ or affectionately known as ‘PIT’ is still available for July with a second position open for August. Please contact PaBIA should you have a daughter or son interested in this position for either month! Patricia Evoy, A11-6 ‘Bigwood Is.’, past PaBIA member and longtime resident of Pointe au Baril. Pat, along with her late husband Gerald ‘Jerry’ operated Evoy’s Marine. Mother of Kirk (Kathy), Heather (Rob) St. George and Shane (Tess), March 2016. David Hofmann, E5 ‘Kingbird’, husband of Jean Hofmann, father of Steve Hofmann, Lisa Beaumont, Lora Benedetti, Kurt Hofmann, Karla Sheeley, March 2016. Ian McAvity, past Islander, son of the late James and Margaret McAvity, brother of the late Virginia (Chil) Heward, March 2016. Wanted: a graphic design volunteer to help PaBIA create Icons for the website and other social media. Please contact Dave Anderson. Ed Garner joined the meeting to inform the Board about Global Rescue, a service for evacuating people in emergencies. This is a transportation service that would be in addition to any medical insurance coverage our members have. More information is needed before PaBIA would include a note in a ‘Connections’ edition e.g. would there be a possibility of a reduction in cost if several members signed up for the service. Ed will report back to the Board when he has more details. PABERT has been disbanded and its boat and other equipment have either been sold or are for sale. It was suggested that we ask our Township Councillors to participate in a call or to attend the Spring Meeting to discuss any progress on providing medical emergency transportation. Once Dan Kuhn is in Pointe au Baril, he plans to get together with TOA Councillors and West Parry Sound Hospital personnel to continue discussions about the topic. PaBIA’s recommendations for the OP were presented by Ian MacLeodlast week. The TOA Planning Department is developing the first draft and it should be delivered within 8 weeks. PaBIA’s OP committee has ongoing contact with our Councillors. Gary French and Ken Williams have some concern that our recommendations might have impacts on some property owners. There are precedents for neighbourhood specific plans so our suggestions do not need to cover the whole Township. Faye confirmed that Gordon Walker will be our guest speaker at the AGM. He is a Cognashene area cottager and is the Canadian Chair on the International Joint Commission. He will be asked to report on topics relevant to Georgian Bay including any progress made related to water level issues. The committee (Earl Manners, Scott Sheard, Helen Bryce and Julia Sievwright (ex officio)) have continued to hold regular conference call meetings. The two GBA representative positions will need to be filled by the AGM. The job description that Earl Manners received from GBA Executive Director Bob Duncanson was circulated to some potential candidates and the committee has contacted others. The Environmental Portfolio Director’s position will need to be filled by the AGM. Dan Kuhn, PPAC Chair, will contact the members of his committee asking for suggestions for specific positions. MOTION: to elect Douglas Barrett as a Director at Large, an interim position until the AGM, to become the Legal Issues Chair. Proposed and seconded by Julia Sievwright, Dan Kuhn. Invitations to the usual guests and all our committee chairs will be emailed before the end of April. Suggestions for the agenda should be sent to Julia. Closer to the meeting, a draft agenda will be circulated. Ojibway Club President Don Wright will be invited to join the Board before lunch to discuss PaBIA & Ojibway Club activities and mutual support. Bill Watts is the Chair of this committee. Dan Kuhn suggested that Bill be added to the agenda of the next Board meeting. It was felt that the process of the permit approval for any future need for dredging be continued.